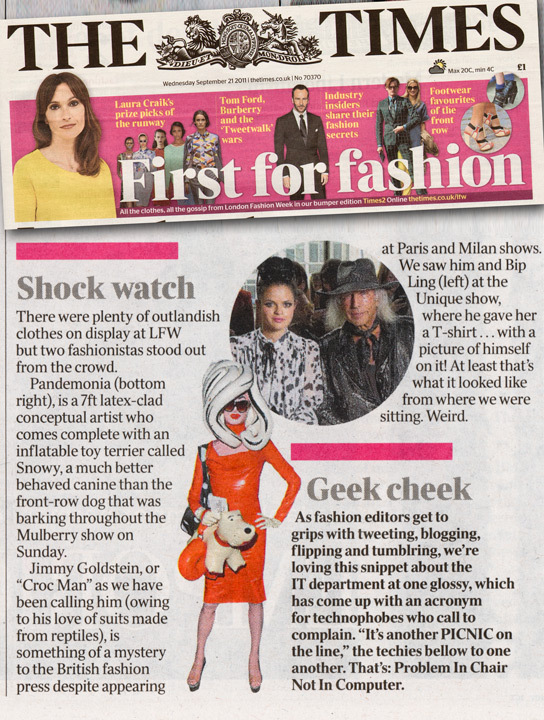 From outrageous clothes to cheeky geeks, our fashion team list some favourite moments from London Fashion Week. 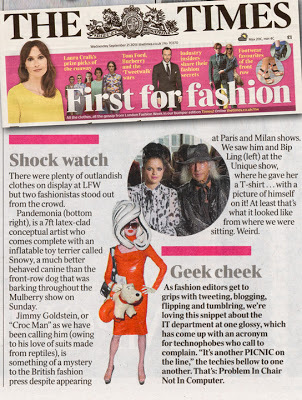 There were plenty of outlandish clothes on display at LFW but two fashionistas stood out from the crowd. Pandemonia is a 7ft latex-clad conceptual artist who comes complete with an inflatable toy terrier called Snowy, a much better behaved canine than the front-row dog that was barking throughout the Mulberry show on Sunday. Jimmy Goldstein, or “Croc Man” as we have been calling him (owing to his love of suits made from reptiles), is something of a mystery to the British fashion press despite appearing at Paris and Milan shows. We saw him and Bip Ling at the Unique show, where he gave her a T-shirt … with a picture of himself on it! At least that’s what it looked like from where we were sitting. Weird.